Clips, bands, ribbons, claws, pins, and more…Hair accessories seem to multiply in the deep, dark recesses of bathroom drawers. Keeping them organized can be a challenge. The key is to regularly declutter hair accessories. Eliminating all the broken, outdated, and unused items will free up space for the things you use and leave your bathroom drawers looking neat and tidy. Start by gathering all your hair accessories in one location in order to take inventory of your supply. As you sort through the various items, look for broken barrettes, claw clips with multiple missing teeth, bent bobby pins, items on which the finish is wearing off or the metal is rusting, and any other unwanted signs of wear and tear. Discard anything that is broken, misshapen, or otherwise damaged. Next, look for items which no longer suit your taste or which you (or your children) have ‘outgrown’. There was a time when my daughters had an impressive collection of fabric scrunchies in every color of the rainbow and multiple combinations. Neither of them would be caught dead in one now. Times change. Kids grow up. If it makes you feel nostalgic, it’s probably a good candidate for the ‘give away’ pile. Also on the chopping block are electric styling tools that aren’t earning their keep. When is the last time you put your hair up in rollers? How often do you use that crimper you got in college? If it’s been years, it is no longer a part of your regular beauty routine. You can safely pass it on. At the very least, you should remove it from the bathroom. Infrequently used hairstyling tools can be stashed in a box under the bed or on the top shelf of the closet for those rare occasions which call for their unique qualifications. While you’re purging, take a minute to clean all the keepers. This is an important part of the process when you declutter hair accessories (or anything for that matter). Dust and grime add to the sense of clutter. Hair accessories can easily develop a film of hairspray or other styling solutions, not to mention dust. Gently wash hair clips, barrettes, plastic head bands, and other accessories in warm water with a few drops of mild soap. Rinse thoroughly and set them on a clean towel to dry. Hair brushes and combs also require regular cleaning to keep them looking good and working well. Start by removing the tangle of hair that has accumulated among the bristles. To do so, slide a pencil between the bristles and gently lift it upward, working it back and forth in order to loosen all that tangled hair. 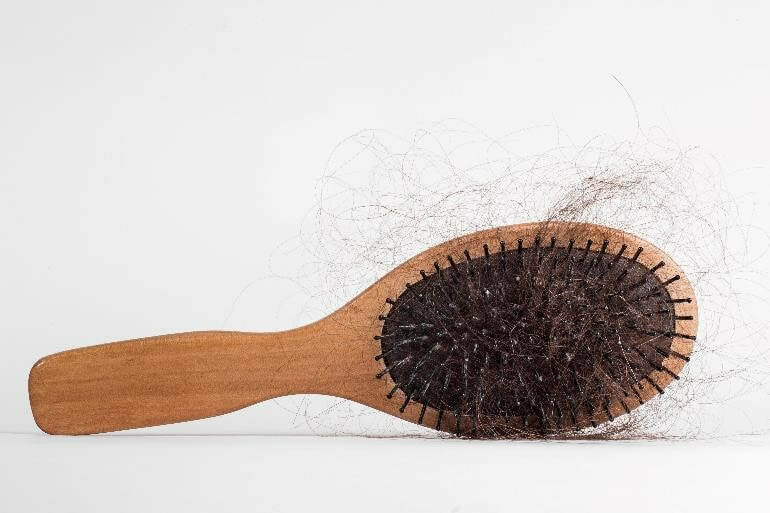 You can use a comb to scrape the tangled hair free, but this method is likely to damage the bristles of your brush and is therefore not recommended. Next, carefully slip a pair of scissors under the loose hair and snip. Use your hand to pull the loosened hair free and discard. Once the brush is free of hair, gently wash it in a sink full of warm water with a bit of shampoo mixed in. Use a toothbrush to clean between the bristles. This method also works well for cleaning combs. Once everything is clean and purged, only one step remains to declutter hair accessories, and that is to put everything back. When organizing hair accessories, store them according to type. When everything is tossed together into a drawer or container in one jumbled up mess things are more likely to get damaged. It is also much harder to find what you are looking for. Use a divided tray, several separate trays, a small plastic drawer organizer, or other similar means to organize your hair accessories by type. 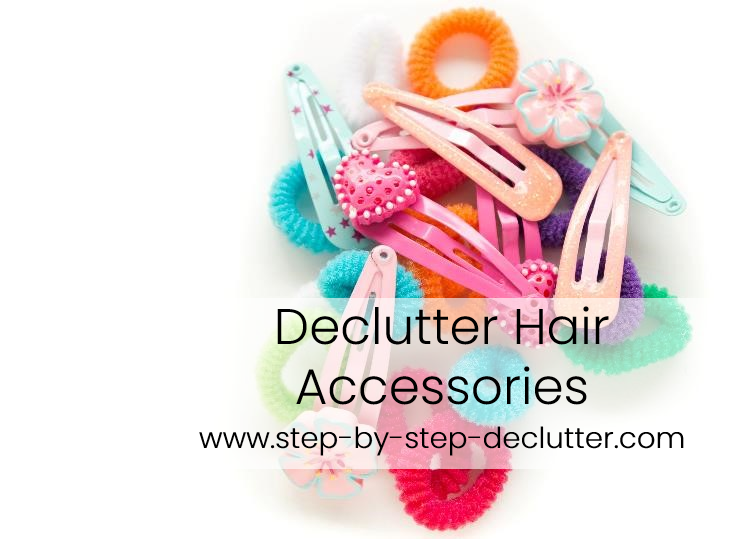 Taking the time to regularly declutter hair accessories contributes greatly to a clean, clutter-free bathroom. It also helps keep hair accessories looking their best, so that you can look your best as well. If you've ever used a flat iron, curling iron, crimper, or other styling tool you know that they quickly develop a sticky buildup from hairspray and other styling products. Here are some tips to keep your styling tools clean. If you know someone who would benefit from this information, please share this page on social media. Then leave me a comment in the section below so I can thank you personally.